Hermosillo (groin) remains out of the lineup Thursday against the Brewers, Jeff Fletcher of The Orange County Register reports. 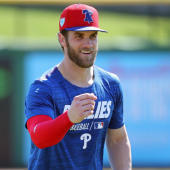 He was the frontrunner to win the fourth outfielder job at the outset of camp, and should eventually slot into that role, but this lingering groin injury may force him to open the year on the injured list. If he can get healthy before Justin Upton (knee tendinitis), then he could get a short run as a semi-regular for the Angels.